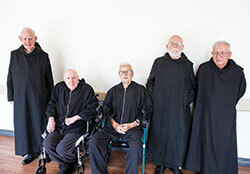 The Benedictine monks of Saint Meinrad Archabbey in St. Meinrad celebrated the jubilees of five of their confreres on May 28. Honored were Father Germain Swisshelm, 60 years of monastic profession; Father Sebastian Leonard and Father Aurelius Boberek, 60 years of priesthood ordination; and Father Matthias Neuman and Father Ephrem Carr, 50 years of priesthood ordination. Father Germain is a native of Orrville, Ohio. He professed vows on Aug.15, 1957, and was ordained on Sept. 25, 1960. He completed a bachelor’s degree in philosophy and a bachelor’s in history at Saint Meinrad Seminary and School of Theology. He also did graduate studies at Indiana University, Oklahoma University and San Marcos University in Lima, Peru. From 1960-62, Father Germain taught at the former Placid Hall at Saint Meinrad. In 1962, he was a founding member of Saint Meinrad’s mission in Huaraz, Peru. He taught at the seminary and high school in Huaraz, and was an associate pastor at San Juan de Lurigancho Parish in Lima. Father Germain served for four years as prior of Los Pinos. While in Peru, Father Germain studied Quechua, an indigenous language in Peru and was founder of Estudios Culturales Benedictinos, which produced a Quechua-Spanish dictionary and several other texts, including a nine-volume manuscript of the New Testament in Quechua. Since 1979, Father Germain has worked in the carpenter shop at the monastery and is custodian of its Mass intentions. Father Sebastian is a native of Indianapolis and grew up in the former Holy Cross Parish. He professed vows on Aug. 1, 1952, and was ordained on May 3, 1957. Father Sebastian earned a bachelor’s degree from the former Saint Meinrad College and a baccalaureate in sacred theology from The Catholic University of America. He has a master’s from Georgetown University and a doctorate from the University of Oxford, both in history. For 25 years, Father Sebastian taught modern Church history at Saint Meinrad Seminary and School of Theology. During some of those years, he also taught history at Saint Meinrad College and served as choirmaster for the monastic community. In 1983, he was appointed associate pastor at St. David Parish in Davie, Fla. In 1995, Father Sebastian became a chaplain and teacher at the Canterbury School in New Milford, Conn. When he retired in 2015, he was the school’s longest-serving chaplain. Father Aurelius is a Brooklyn, N.Y., native. He professed vows on Aug. 1, 1952, and was ordained on May 3, 1957. Father Aurelius received a master’s in liturgical studies from the University of Notre Dame and a master’s from Indiana University. Father Aurelius was a professor and dean of students at Saint Meinrad College for many years. Following graduate studies, he was a professor, pre-theology dean and vice rector of Saint Meinrad Seminary and School of Theology. He was also master of ceremonies and assistant director of the oblate program for the archabbey. He taught at the American College of Louvain in Belgium from 1997 to 2008 as director of liturgy and professor of homiletics, as well as two years as vice rector. When he retired, he was awarded the college’s first Archbishop Fulton Sheen Medal. Father Matthias is a native of Huntingburg, Ind. He came to Saint Meinrad in 1955 to attend high school. He earned a bachelor’s degree in philosophy from Saint Meinrad College in 1964, a master’s of divinity from Saint Meinrad School of Theology in 1967, and licentiate and doctorate degrees in systematic theology at Sant’ Anselmo in Rome. He joined the monastery in 1961, professed vows on Aug. 15, 1962, and was ordained a priest on Sept. 24, 1967. He taught theology at Saint Meinrad Seminary and School of Theology from 1969 to 1981. The next year, he began an eight-year stint as professor of theology and director of the pre-theology program at Saint Meinrad College. Other assignments have included director of Saint Meinrad’s Summer Session Program, its director of continuing education, and associate pastor and pastoral resource theologian for the Diocese of Nashville, Tenn. Currently, he serves as chaplain for Our Lady of Grace Monastery in Beech Grove and as an adjunct professor for Saint Meinrad Seminary and School of Theology. Father Ephrem, a native of Toledo, Ohio, professed vows on Aug. 15, 1963, and was ordained a priest on Sept. 24, 1967. He received a licentiate in Eastern Church studies in 1970 from the Pontifical Oriental Institute in Rome. In 1978, he received his doctorate in theology from Sant’ Anselmo in Rome. In addition to teaching at Saint Meinrad from 1970-78 and 1981-87, he served as its academic dean for six years. He also served as subprior (third in leadership) of the monastery from 1978-86. Father Ephrem was on the faculty at Pontifical Athenaeum Sant’Anselmo from 1986-2013, where he taught courses in Oriental liturgy, Oriental monasticism, and Syriac. He also is the author and editor of many scholarly articles and books. From 2008-12, he served as president of the Pontifical Institute of Liturgy in Rome.